My family is fond of this recipe from Hershey’s Kitchens. My husband even chose to take these chocolaty pastries to share with his coworkers instead of birthday cake! Those of you who believe cream puffs must be difficult to make will be surprised that the only real predicament you may run into, is keeping your paws off the entire batch. I made the puffs smaller than the recipe states, and watched the oven until they were light golden brown. I imagine bigger might be better when it comes to hogging my own cream puff, and will make them full size next time. 1. Sprinkle gelatin over cold water in small cup; let stand 1 minute to soften. Add boiling water; stir until gelatin is completely dissolved. Cool slightly. 2. Stir together sugar and cocoa in medium bowl; add whipping cream and vanilla. Beat on medium speed of mixer, scraping bottom of bowl occasionally, until mixture is stiff. Pour in gelatin mixture; beat until well blended. Store in the refrigerator while you make the pastry. 1. Heat oven to 400°F. Grease cookie sheet. 2. Combine water, butter and salt in medium saucepan; cook to boiling, stirring until butter melts. Add flour all at once; stir vigorously over low heat about 1 minute or until mixture leaves the side of pan and forms a ball. Remove from heat. 3. Add eggs, one at a time, beating with spoon after each addition until smooth. Drop dough by heaping tablespoons into 6 mounds, 3 inches apart, onto prepared cookie sheet. 4. Bake 25 to 30 minutes or until golden brown. Remove from cookie sheet to wire rack. Horizontally slice small portion from top of puffs; set tops aside. Remove and discard any soft dough from inside puffs. Cool completely. Fill puffs with the chocolate mousse; replace tops. Refrigerate about 1 hour and sprinkle the top with powdered sugar just before serving. This recipe belongs to the Hershey’s Kitchen. You can find many more free Hershey’s recipes at http://www.hersheys.com/recipes/home.asp. Picture and write-up by Laura Flowers. Laura are these really easy to make? I really can not imagine mine turning out as good as yours!!! Your cream puffs look like they should be in one of the finest bakeries in the country. Have great weekend!! Just found your blog.LOVE it.. These look delicious! delicious! Delicious. I cant wait to go through your other recipes. Nice to meet you. Ginger these are so easy. I put the dough into a piping bag and had them on a parchment covered cookie sheet in about a minute. It's crazy how quick they are to make. Thank-you Donna! You made my day! Oh, my. These look so good. I have a weakness for cream puffs whatever their size. Those look so delicious!! I love to make and eat cream puffs!! Thanks for sharing! I haven't made cream puffs in probably a decade. Never with chocolate mousse filling. It's time to start anew. These look fantastic. 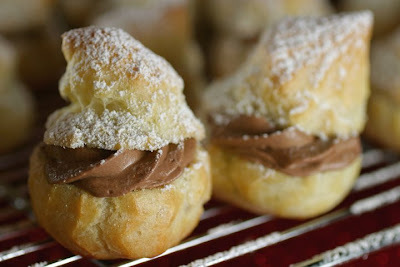 I haven't made my own cream puffs yet, but it's on my list. You did a great job - they look amazing. I love making cream puffs... your filling looks delicious!